One of the first questions Paley Rothman ask is "What do you want to achieve?" By seeing matters through the lens of their clients is the first step in developing a strategy to meet desired objectives. The Paley Perspective is problem-solving approach, combined with a legal sophistication and a unique understanding of the ever-changing business landscape. 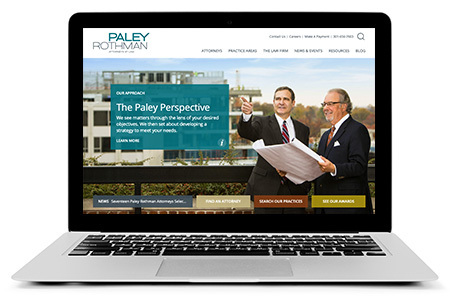 The new, fully responsive website is clean and easy to navigate across all devices and an identity that reflects the law firm's growth and a cutting-edge website, embraces the sophistication that makes Paley as worldly as their Washington D.C. metro area clients. Now with an integrated design system and digital experience, Paley's growing brand can keep up with their evolving industry leadership and innovation. Every element of the brand system – color palette, custom photography, and brand messaging – evoke the problem-solving perspective of the Paley experience. 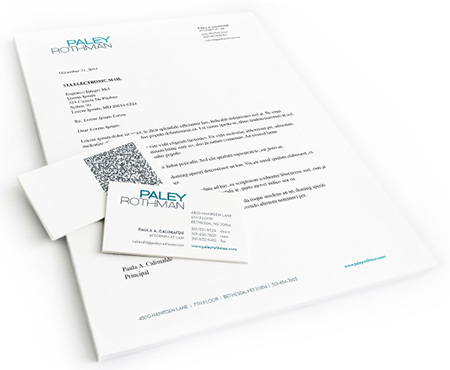 To go along with the new visual identity and services architecture, Moiré worked closely with Paley Rothman to refresh the brand with a clean and vibrant comunications system that reinforced the law firm’s strategy and helped them stand out in a crowded marketplace.